As restaurant week was wrapping up in Allentown, my partner in crime J and I made our visit to downtown Allentown. Although we’ve both had food and drinks at The Hamilton before, it was never quite like our 3 course extravaganza we shared on our Thursday night visit. Despite cloudy skies and a light drizzle on our walk over, we sat outside to enjoy the 65 degree weather and slight breeze. I love sitting outside and enjoying a meal even if it means frizzy baby hairs after. I have to say, it felt good seeing the eager crowd of people passing by enjoying the city. 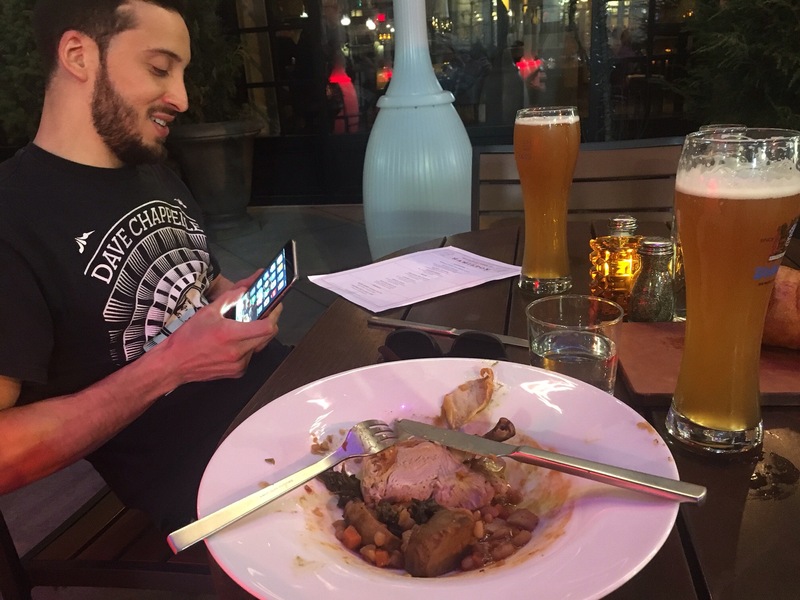 There’s lovely J… always in his phone. Let’s get to the good stuff. 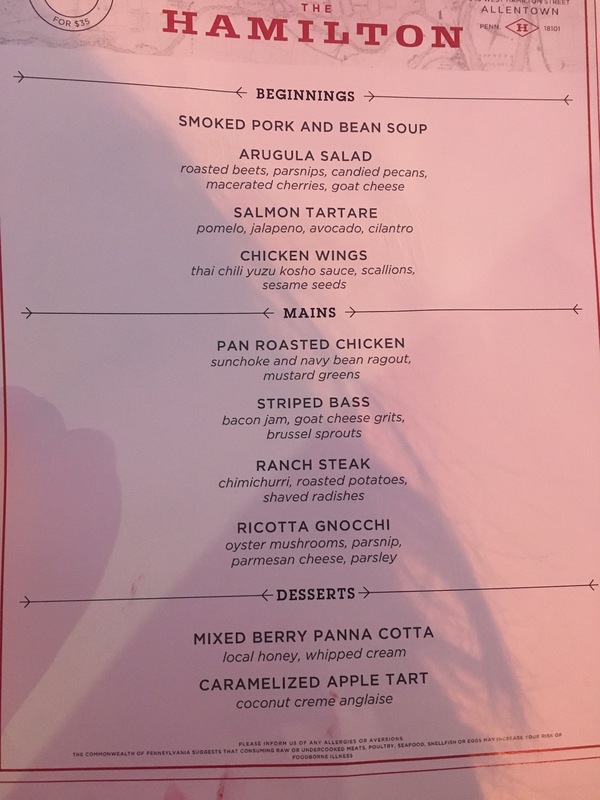 The menu was simple, yet well executed. 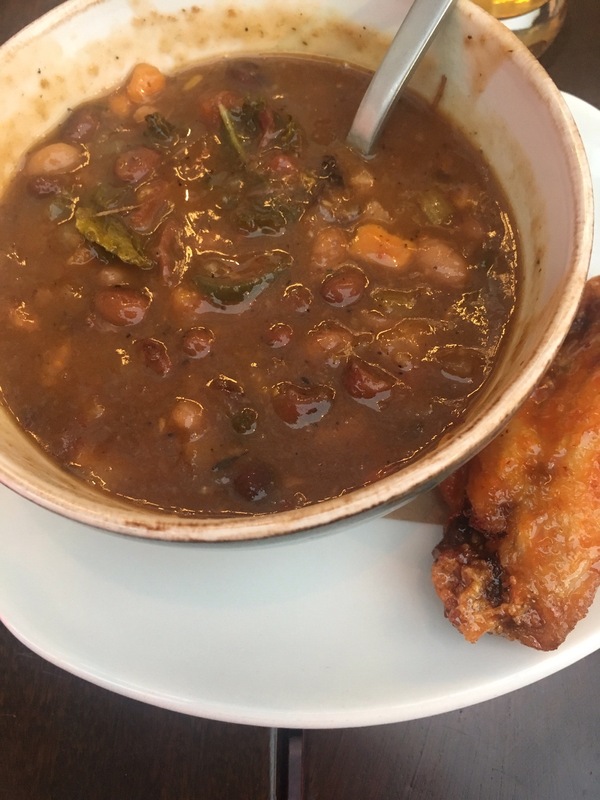 Although it was relatively warm outside, I started with the Smoked Pork and Bean Soup. A couple weeks back I had a mean craving for navy bean soup and made it myself for the first time and it came out absolutely delicious. Fast forward a couple weeks and the craving struck back. The picture isn’t the greatest but I was in a major rush to lick my bowl clean. The smoky shredded pork was abundant in the soup which was nice because restaurants tend to be a little skimpy in the meat department. Soft kidney and navy beans with soft kale and tender onions and a slightly thick pork broth with mild heat hit the spot. J made a typical guy choice and ordered the wings. The Thai chili yuzu koshu sauce (say that 5 times fast) was straight from Thai. I only know that because my dear friend Sandra is a line chef at The Hamilton and let me in on the secrets. These wings were SPICY. Thank goodness for my ice cold beer because it saved my life. “Thai” should’ve been a dead give away that is was going to be spicy. 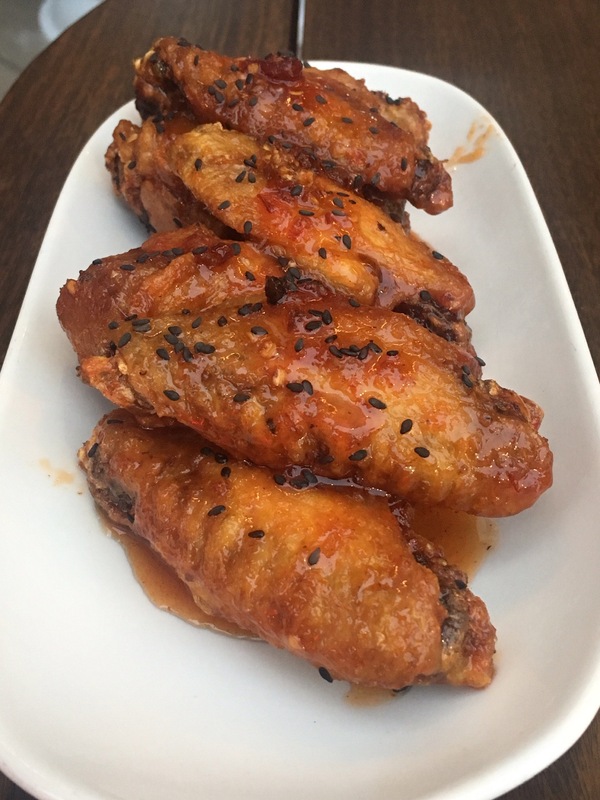 The crispy wings were smothered in the sauce so it was hard to avoid the heat but after two or three your mouth just becomes numb and you keep on keeping on. The black sesame seeds had a distinct taste but I was a little disappointed there was no scallions like the menu promised, but good dish nonetheless. One thing I appreciate is in life is the beauty of a perfectly roasted chicken. It’s easy to over cook a chicken and end up with dry poultry that will discourage you from ever making it again. Although the chicken did not have much seasoning, it was so juicy inside and really didn’t need any extra flavor because it’s natural chicken juices were just right. 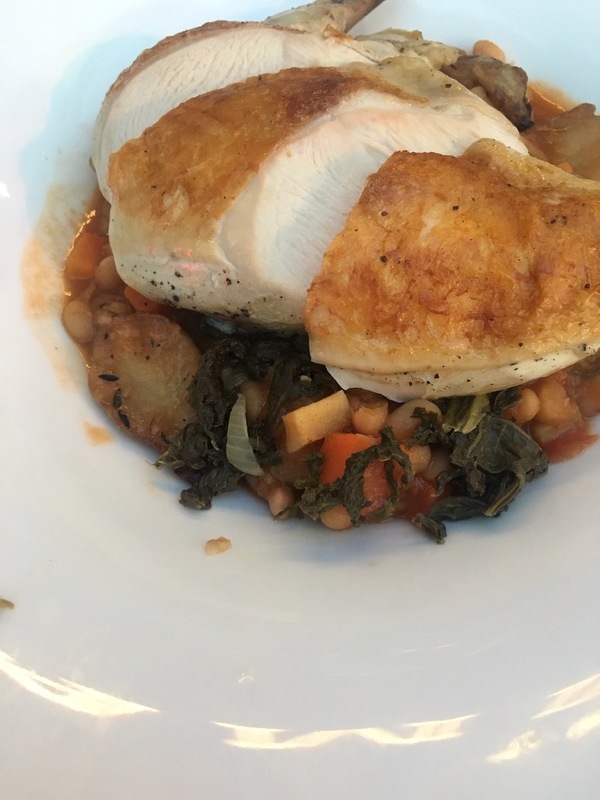 The sunchoke and navy bean ragout with mustard greens was seasonal bliss and a perfect bed for the chicken thigh. For those who don’t know what sunchoke is, it’s referred to as a Jerusalem artichoke and is apart of the sunflower family. When raw, it looks like a ginger stalk. Dessert hands down stole the show. I’ve always been a fan of panna cotta, partly leaders because it’s tasty and partly because I never have the patience to make it myself. The gelatin like Italian dessert was creamy, smooth and the perfect amount of sweet. The vanilla bean was super obvious but I did not mind one bit. 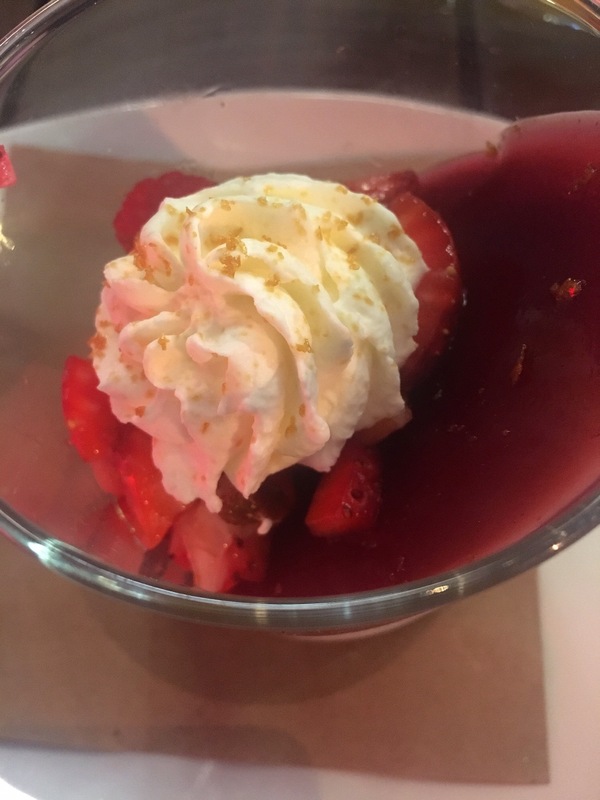 The fresh chopped berries was the perfect fresh bite to top the light dessert. Lucky for me I can ask my dear friend Sandra how it was made, and maybe I’ll get lucky enough and she’ll make it for me. Wishful thinking. Me and J have this mutual rule that we have to order something different so that we (mostly myself) get to try as much as possible. 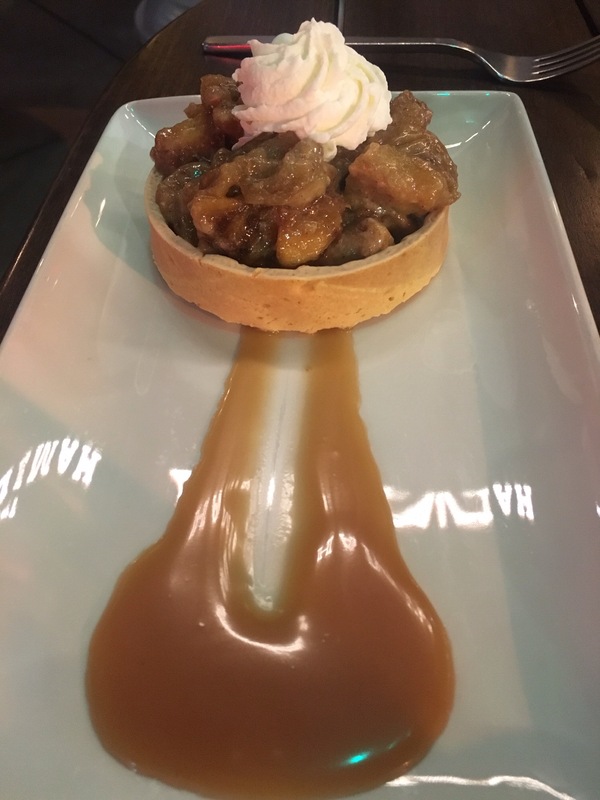 I scored with the panna cotta and he scored with the Carmelized apple tart. Didn’t care too much for this one but it was purty. It was another successful restaurant week in the Valley folks.